Most of the meat we purchase in the supermarket today is grown in crowded, confined conditions, where the animals have little, if any, outdoor access, and are fed a grain-based diet, laced with antibiotics, hormones and other ingredients. Although the classic image of cows grazing lazily, chickens pecking the ground at their feet and pigs rooting around the barnyard on Grandma's farm is long gone from the commercial landscape, some New Jersey family farms raise and sell meats for local customers. Like fresh fruits and vegetables from the local farmstand, stock raised with special attention to nutrition and living conditions is likely better for you. And it tastes better, too! Project Grass is a group of Sussex and Warren county farmers who rely on pasture, along with hay and grass silage, for much of their livestock's dietary needs. These animals spend the majority of their lives roaming the pasture, eating the grass at will, and enjoying the great outdoors. "I think it has a profound effect on the health of the animals, the health of those who consume the foods we get from animals and the overall health of the farms that adopt these practices," says Matt Pearson of Howling Wolf Farm in Hope. From start to finish, these farmers are hands-on with their livestock­beef, pigs, goats, rabbits, lamb, chickens and turkeys­working to ensure that humanely-raised, healthy animals are processed and packaged with the utmost care. The group, which also includes grass farmers and hay suppliers, seeks to actively promote the nutritional, ecological, and humane benefits of grass-fed methods. Basia and Gary Van Boerum, of Snoep Winkel Farm in Branchville, sell pasture-raised beef, lamb, goat, chicken and grass-fed rabbit. "The kids got started in 4-H. Especially as parents, it really hit home to us, to know how the food we were feeding our children was raised," Basia says. "We really believe that the animals need to be treated humanely." The Van Boerums use only vegetarian grains to supplement the animals' diets, never the animal by-products found in most commercial feeds. Whether raising a chicken or steer, the Van Boerums and the other Project Grass farmers believe that the quality of the animals' lives is reflected in the quality of the food. The emphasis on traditional farming methods­focusing on small herds, animal diversity, natural ingredients and grazing­is part of growing movement back towards environmentally friendly agriculture. "Project Grass is promoting a healthier, more sustainable agriculture," Dana Ortstein, of DanaRay Farm in Branchville, says. "We're part of a greater good." 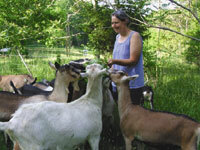 DanaRay is biodynamic, using everything on the farm to complement and benefit everything else. Extra goat's milk is fed to the pigs. The chickens eat the insects. The vegetables are fertilized with the composted manure from all of the healthy, pastured animals. Pearson, who also practices biodynamic farming at Howling Wolf, says that part of the mission of Project Grass is to introduce local farmers to "the benefits which pasturing livestock have on the sustainability of farms." Farms that promote healthy land, fertile soil, and conditions conducive to good health of the livestock are self-perpetuating, with little outside input required. A grass-based farmer doesn't need to purchase expensive commercial feeds. Animals in healthy environments don't need antibiotics added to their food. A recent study by the Union of Concerned Scientists has shown that meat, eggs and diary products from grass-fed, pastured animals are higher in "good" fats and lower in "bad" fats, and that the manure produced can be readily returned to the farm as fertilizer. Confined, grain-fed animals produce disease and manure that cannot be absorbed into the ground, running off and contaminating waterways, the study concluded. 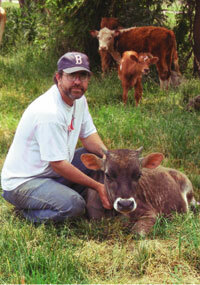 Louis Tommaso raises grass-fed beef and pork, pastured on his 185 acre, 70-year old farm in Green Township. Although he uses no hormones, antibiotics or steroids on his livestock, he had been spraying his hay with a conventional chemical product to combat weeds. By his own admission, he has learned how to be more environmentally friendly from other Project Grass farmers. "When you grow something and you don't use chemicals, it is always better than using chemicals," Tomasso says. So he was thrilled when he learned that his yield was more than acceptable after only spot-spraying field weeds, using a very diluted solution. Not only do Project Grass members share ideas, they happily refer customers to one another. And several marketing projects have augmented their public profile. There is a Project Grass booth set up most Sundays at the Olde Lafayette Village Farmer's Market. The group held a cooking demonstration, grilling up fresh grass-fed meats and handing out promotional literature at the Warren County Farmer's Fair Cook's Corner. And a recent pasture walk and farm tour at Howling Wolf Farm showed consumers and the media just how grass-based farming works. Many of these small farmers felt a lack of support from the State of New Jersey's agriculture programs, aimed at larger-scale commercial operations. Many of the state's rules and regulations pertaining to butchering and selling meat and animal products overlook the needs of the small farmer. By forming a cohesive voice for the common interest of these farmers, Project Grass can advocate at the state level. Another frustration that led to the group's formation was the lack of a cohesive farming infrastructure in Northwest NJ. Farm supplies, equipment, labor­even hay grown in a manner acceptable to the farmer­are becoming scarce locally. A network of farmers gains purchasing power and shares resources. Each farmer applies the grass-fed edict in his own way. At Havenwood Farms, eggs come from free-range, pastured-based chicken. The chickens are rotated to fresh pasture every two days, which keeps the quality of the grass they are foraging high. Certified organic grain feed supplements the diet of the poultry, which require added protein due to their high metabolism. Beef farmers may differ in the amount or type of grain used, or might not supplement their stock diet with grain at all. Others might use organically-grown hay to "finish" the beef, imparting a flavor with which today's consumers have become accustomed. "High-quality, grass-fed beef is a complex skill that requires time for farmers to learn," Pearson says. "That is the situation we have here in NJ now: huge demand, and a few farmers honing their skills. NJ Project Grass would love to see more farmers learning the skills of grass farming." Aside from onerous regulations, the farmers have found it difficult to reach today's busy consumers, many of whom find the supermarket more comfortable than the farm. "Many of the issues of concern revolved around the difficulties of directly marketing to consumers here in NJ," Pearson says. Bringing consumers out onto the farm and showing them a superior product is a major focus of the group. "Fresher meat, fresher product. They themselves can physically see where it is coming from," Tommaso says. In order to make buying meats right off the farm more appealing to consumers, Project Grass farmers offer many of their meats individually cut and wrapped. To cater to smaller families, those with a budget, or those wanting to give a local farmer a tryout, many are offering smaller shares, instead of 1/2 or 1/4 of an animal, Some are also experimenting with selling by the cut, rather than the portion. But buying beef or pork by "the side" is actually a great way to be-come re-acquainted with some tasty cuts of meat not often available on the supermarket shelf. All of the farmers are happy to share cooking tips, especially for the brisket, spare ribs, or other parts of the meat not commonly used today. Even those cuts that are traditionally saved for "special occasions," such as a ham, can be readily used for a not-so-difficult dinner when cut into small roasts or cubed for grilling. Part of the experience is learning what meat grown using age-old farming practices looks like, how it tastes, and how to use it. "The meat was raised the old-fashioned way. You have to cook it the old-fashioned way," says Basia Van Boerum. So go ahead, explore some local meats today. The NJ Project Grass farmers are waiting for your call and willing to answer your questions. Make local, grass-fed meats part of your family's diet. For farmers interested in learning more about joining NJ Project Grass please contact the Foodshed Alliance, 908-362-7967. Equine, hay producers and part-time farmers are also welcome.